You calculate your cost savings by looking at how many issues your users found and corrected with Acrolinx. The charts on this dashboard give you insights on your cost savings according to the configurations you've set in Cost Savings Settings . For more information on how to configure this dashboard see the article Configuring the Cost Savings Dashboard . Cost Savings by Period View the calculated cost savings broken down by time. 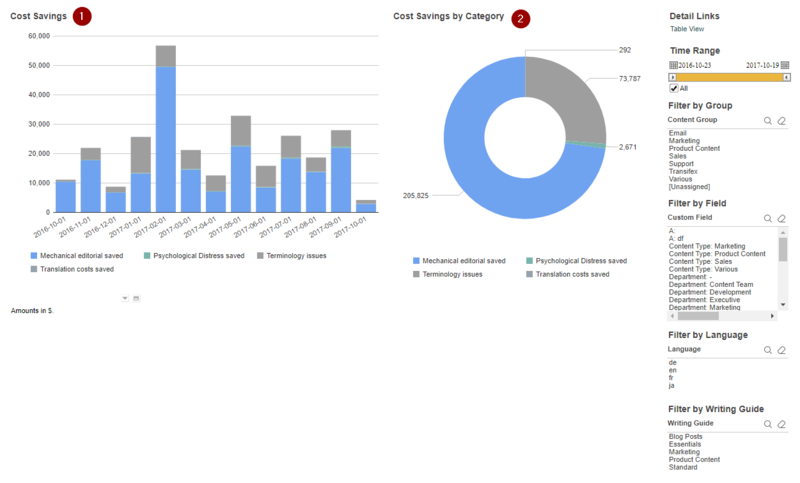 Cost Savings by Category View the calculated cost savings broken down by category. You can also open a more detailed web report. Table View Open a web report to see your cost savings broken down in a table.